Disaster, as defined by the United Nations, is a serious disruption of the functioning of a community or society, which involve widespread human, material, economic or environmental impacts that exceed the ability of the affected community or society to cope using its own resources . Disaster management is how we deal with the human, material, economic or environmental impacts of said disaster, it is the process of how we “prepare for, respond to and learn from the effects of major failures” . Though often caused by nature, disasters can have human origins. According to the International Federation of Red Cross & Red Crescent Societies a disaster occurs when a hazard impacts on vulnerable people. The combination of hazards, vulnerability and inability to reduce the potential negative consequences of risk results in disaster . Natural disasters and armed conflict have marked human existence throughout history and have always caused peaks in mortality and morbidity. This article examines the advances in the humanitarian response to public health over the past fifty years and the challenges currently faced in managing natural disasters and armed conflict . The United Nations Office for Disaster Risk Reduction characterise Natural Disasters in relation to their magnitude or intensity, speed of onset, duration, and area of extent e.g. Earthquakes have short durations and usually affect a relatively small region, whereas Droughts are slow to develop and fade away and often affect large regions . The International Federation of Red Cross & Red Crescent Societies defines disaster management as the organisation and management of resources and responsibilities for dealing with all the humanitarian aspects of emergencies, in particular preparedness, response and recovery in order to lessen the impact of disasters . "The outright avoidance of adverse impacts of hazards and related disasters "
UNISDR views Disaster Prevention as the concept of engaging in activities which intend to prevent or avoid potential adverse impacts through action taken in advance, activities designed to provide protection from the occurance of disasters . WCPT similalrily highlight that while not all disasters can be prevented, good risk managament, evacuation plans, environmental planning and design standards can reduce risk of loss of life and injury mitigation. The HYOGO Framework was one such Global Plan for natural Disaster Risk Reduction, which was adopted in 2005 as a 10 year Global Plan, signed by agreement with 168 Governments which offered guiding principles, priorities for action, and practical means for achieving disaster resilience for vulnerable communities . "The knowledge and capacities developed by governments, professional response and recovery organizations, communities and individuals to effectively anticipate, respond to, and recover from, the impacts of likely, imminent or current hazard events or conditions" . According to ICRC, Disaster Preparedness refers to measures taken to prepare for and reduce the effects of disasters, be they Natural or Man-made. This is achieved through research and planning in order to try to predict areas or regions that may be at risk of disaster and where possible prevent these from occurring and/or reduce the impact those disasters on the vulnerable populations that may be affected so they can effectively cope. Disaster preparedness activities embedded with risk reduction measures can prevent disaster situations and also result in saving maximum lives and livelihoods during any disaster situation, enabling the affected population to get back to normalcy within a short time period . Minimisation of loss of life and damage to property through facilitation of effective disaster response and rehabilitation services when required. Preparedness is the main way of reducing the impact of disasters. Community-based preparedness and management should be a high priority in physical therapy practice management . "The provision of emergency services and public assistance during or immediately after a disaster in order to save lives, reduce health impacts, ensure public safety and meet the basic subsistence needs of the people affected" . Focused predominantly on immediate and short-term needs the division between this response/relief stage and the subsequent recovery stage is not clear-cut. Some response actions, such as the supply of temporary housing and water supplies, may extend well into the recovery stage. Rescue from immediate danger and stabilization of the physical and emotional condition of survivors is the primary aims of disaster response/relief, which go hand in hand with the recovery of the dead and the restoration of essential services such as water and power . The WCPT provide advice on how physiotherapists can most effectively contribute in disaster situations highlighting the role for the profession in the aspects of disaster management described above. 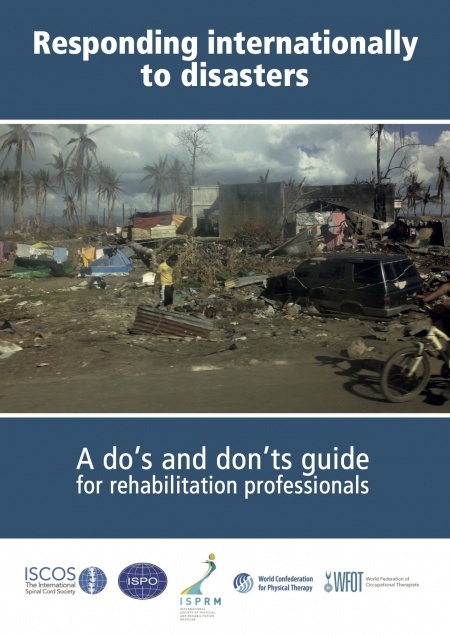 When disasters strike, there is always a huge amount of goodwill from rehabilitation professionals around the world who wish to use their skills to support those affected. This brief guidance informs those who are considering responding internationally to a disaster either as individuals or as part of a team. It highlights key questions to consider before departing, whilst working in the disaster area, and on returning home. Responses to these questions considered are presented as “Do’s and Don’ts” which are exempli ed by recommended practices and those to avoid in the real case studies below. The guidance note is not intended to be a step-by-step or technical guide, nor is it exhaustive, and does not supersede any specific guidance provided by your own global professional body. 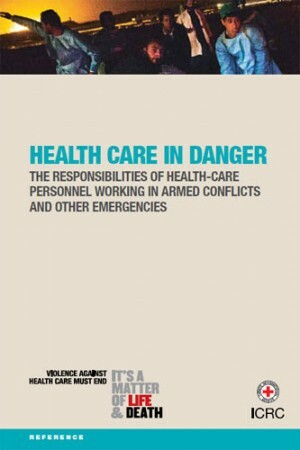 A Guidance Document in simple language for health personnel, setting out their rights and responsibilities in conflict and other situations of violence. It explains how responsibilities and rights for health personnel can be derived from international humanitarian law, human rights law and medical ethics. 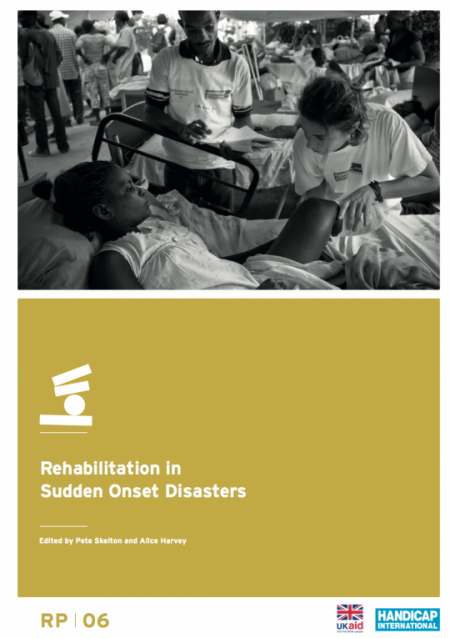 Rehabilitation in Sudden Onset Disasters. This document is the result of collaboration between a working group of rehabilitation experts convened by WHO and external consultations. It is thus based on collective experience in rehabilitation during responses to recent large-scale emergencies and also on published data. In time, the minimum standards for rehabilitation in emergencies will be part of a broader series of publications based on the Classification and minimum standards for foreign medical teams in sudden onset disaster. 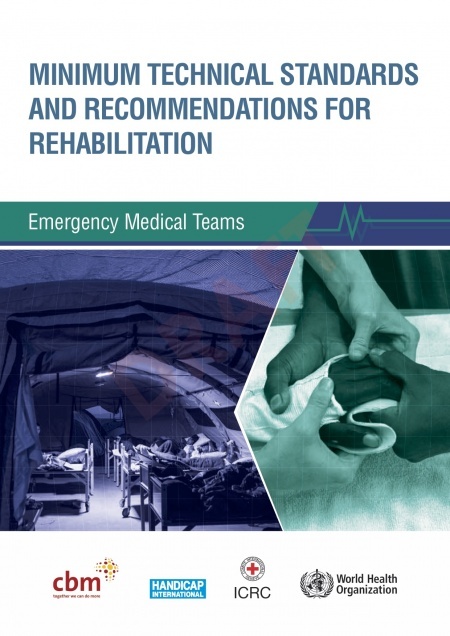 The purpose of this document is to extend these standards for physical rehabilitation and provide guidance to Emergency Medical Teams (EMTs) on building or strengthening their capacity for and work in rehabilitation within defined coordination mechanisms.The standards and recommendations given in this document will ensure that EMTs, both national and international, will better prevent patient complications and ensuing impairment and ensure a continuum of care beyond their departure from the affected area. This manual is intended to help health professionals and public health coordinators working in emergency situations prevent, detect and control the major communicable diseases encountered by affected populations. The WHO Emergency Medical Team (EMT) Initiative helps countries and NGOs to set up teams that will be able to maintain agreed standards of quality and self-sufficiency, resulting in better patient care. 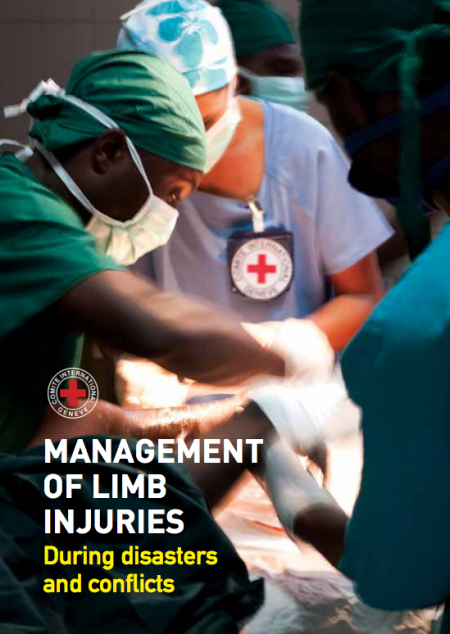 With more teams striving to reach these standards, clear guidance on best practice is needed, particularly for managing patients with limb injuries, which make up the majority of cases. The consensus-based Field Guide—Management of Limb Injuries during disasters and conflicts and the complementary open-access online resources gathered here are aimed at providing that guidance. It draws on the expertise of the International Committee of the Red Cross, which has a long history of delivering care to patients and protecting them in conflict. This field guide will be regularly updated as new controversies are raised and evidence grows. We thank you for your commitment to deliver care to those that need it most in the world’s most challenging contexts and trust that you find this text fit for purpose..
↑ Elliott D. Disaster and Crisis Management. In The Handbook of Security 2014 (pp. 813-836). Palgrave Macmillan UK. ↑ WCPT. What is Disaster Management. http://www.wcpt.org/disaster-management/what-is-disaster-management. [Accessed 8 Jan 2017].